Spaghetti?! Who doesn't mind having it once in awhile, my two kids is 100% love to eat rice but there will come to a time where Ma, I don't want to eat rice. What is the fastest dish to do is definitely this! Spaghetti is always available in my counter top. Its more like a quick meal for breakfast, dinner etc..
And my kids loves beef streaks, pepperoni etc..but I don't let them eat often due to the amount of oil in it! Geez! But once a while would be nice. 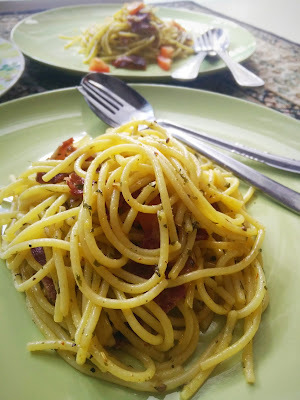 Cripsy, juicy..
Plus, I feel that aglio olio is the most fastest dish you can whip in less than 20min. 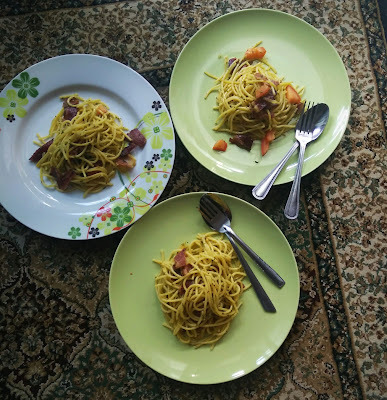 I have so many version of aglio olio.. This would be the first to share. 1. Boil your water half pot. Once its boiling add in the spaghetti. Let it cook al Dante. 2. Once the beef streak is cooked in the microwave gently chopped or slices it. 3. Strained the pasta from the water add 1 tbsp of olive oil to keep it moist. 4. Heat up the wok, add in the 2 tbsp of oil. Slowly add in the chopped onion, fry it to bring out the fragrant. 5. Add in the beef streak and pasta. Cook it together. 6. Add in the salt and pepper to taste. 7. Garnish with paprika once its serve on the plate. Yes please. We are the biggest rice eater, nevertheless, we will happily welcome this spaghetti aglio-olio. Nicey preasy.